PARIS, (Reuters) – Maiden grand slam finals are meant to be suffocating experiences but Jelena Ostapenko laid waste to that theory as she blasted past Simona Halep to win the French Open in audacious fashion yesterday. In only her 18th match in one of the four majors, the 20-year-old Latvian fought back from a set and 3-0 down to blaze past the experienced Romanian 4-6 6-4 6-3 and become her country’s first grand slam champion. Not only that but she is the first unseeded woman to win the Suzanne Lenglen trophy since 1933 and she emulated the great Brazilian Gustavo Kuerten by claiming her first title of any kind on the hallowed Parisian claycourts. Kuerten’s 1997 victory came on the day Ostapenko was born. Ostapenko had promised to stick to her uncomplicated routine of attack-attack-attack before the final and was true to her word as she walloped 54 clean winners — and 54 unforced errors. It was claycourt tennis, but not as we know it. Third seed Halep buckled under the strain of fending off the missiles being launched off Ostapenko’s lime green racket. Yet for much of the contest, hanging into rallies by her fingernails, it seemed Halep’s steady approach would see her become only the second Romanian woman to win a grand slam title after her manager Virginia Ruzici’s 1978 Roland Garros win. It was not to be though. To make it a doubly difficult day for the 25-year-old, the defeat meant she also missed out on becoming world number one tomorrow. “I felt like a spectator out there at times,” Halep, who had points to lead 4-0 in the second set and was also 3-1 ahead in the decider, told reporters after her second runner-up finish here. 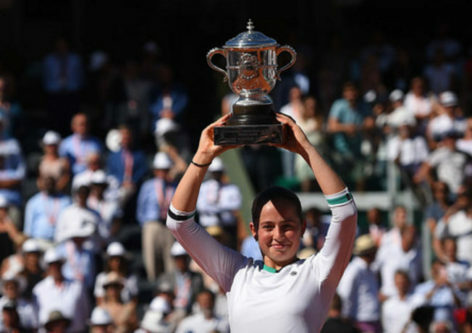 Ostapenko, who had the Parisian crowd roaring her on, reeled off the last five games to claim the title and become the youngest female first-time grand slam champion since Russian Svetlana Kuznetsova won the 2004 U.S. Open. Fittingly she thumped a backhand winner past Halep to seal victory, before tossing her distinctive green headband into the crowd with a look of disbelief. Ostapenko, who turned 20 on Thursday when she beat Swiss Timea Bacsinszky, will rocket to 12th in the rankings. “I mean I can’t believe I’m champion at 20,” Ostapenko, the first woman to win the title from a set down since Jennifer Capriati in 2001, said on court. “I knew that Gustavo Kuerten won his first Roland Garros the day I was born, I have no words. In baking sunshine Ostapenko began the match by breaking Halep’s serve with three clean winners. Halep, with cheers of ‘Simona’ ringing out from her fans slowly roasting in the upper tiers of Philippe Chatrier Court, hit back though and broke three times to take the opener as Ostapenko’s error count soared to 23. Ostapenko seemed to be unravelling in the second set as a series of shots either netted or flying long allowed Halep to move 3-0 ahead. The Romanian then had break points to make it 4-0 but Ostapenko held to massive cheers. Back on the attack Ostapenko surged 4-3 ahead only for more errors to allow Halep to break back for 4-4. Halep was suffering though and Ostapenko broke to love before levelling the match with a sublime forehand winner. Even when Halep went 3-1 ahead in the decider, she never seemed in control and once Ostapenko’s charge began she was powerless as ball after ball flew by.